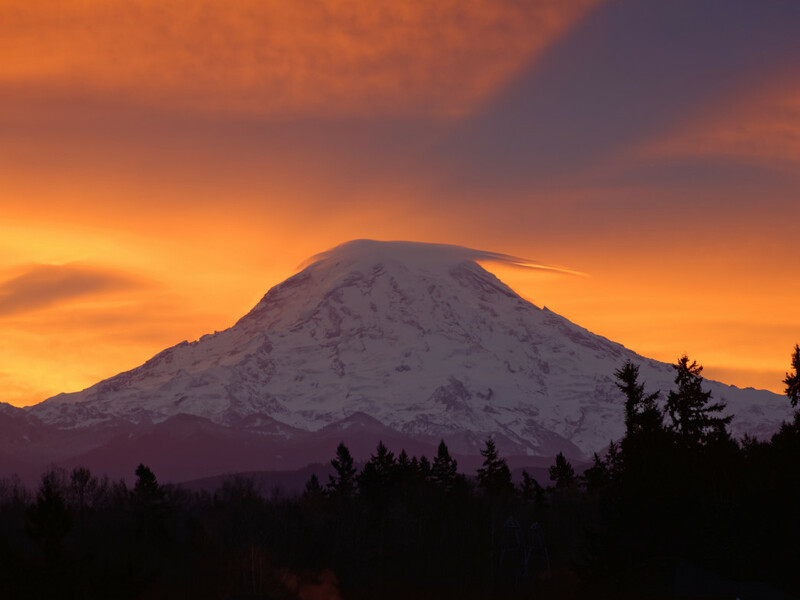 You’ve seen the postcards: Mount Rainier shining on Seattle’s skyline, Mount Hood standing guard over Portland, Mount Shasta sunset-fired over dark lava plains. The High Cascade snowpeaks, with their gigantic viewsheds, are gorgeous and beloved, explaining an awful lot of the appeal of the Pacific Northwest landscape. Their beauty is undeniable, but it’s worth considering, too, how downright otherworldly they appear—adding a very particular and commanding (and sort of unreal) element to the region. Otherworldly? Sure: The central and southern Cascade Range—from Snoqualmie Pass south to Mount Lassen—is surreal-looking. There’s no blocky wall of stony summits, as you find in the Rockies or the Sierras or the Basin-and-Range—or, for that matter, in the borderline-unreasonably steep, spiky North Cascades. Instead, you have the lake-sprinkled plateaus and gentle shield volcanoes of the long Cascade Crest, flanked by rough low ridges to the west and gulch-cut benchlands to the east; and then, like a complete topographic glitch, huge standalone snowpeaks, generally spaced out from one another by dozens of miles, plunked down atop these modest green highlands. It’s sort of like some sort of bored deity carved out a couple handfuls of Rocky Mountain summits and tossed them, smack-dab, over the Appalachians. Of course, there’s a sturdy-enough geological explanation for the imbalanced terrain. Nearly all of the greatest High Cascade peaks are classic stratovolcanoes grown atop a platform of their own petrified emissions, shields and cinder cones, and the eroded bones of ancient predecessors. 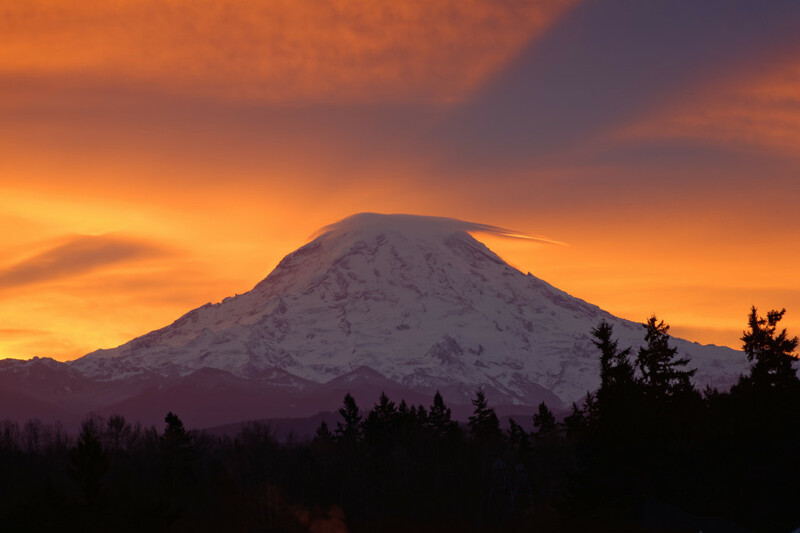 And it all speaks to the Pacific Northwest’s super-restless position at the leading edge of North America—the Ring of Fire and all that. But the perfectly sound geology doesn’t make the visual impact of these spread-out snowpeaks any less head-spinning. 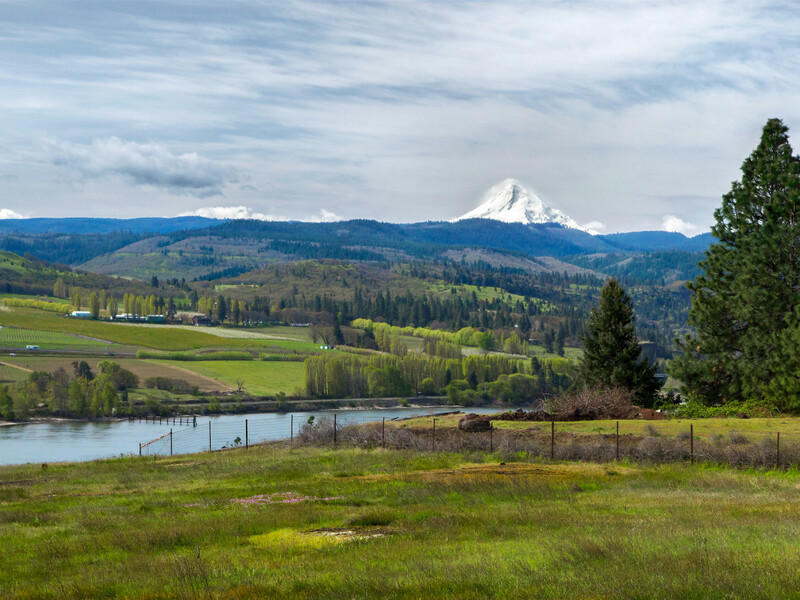 This stretch of the Cascades makes a sort of three-tiered landscape: First, the lowland realm of oak savannas, sagebrush steppe, marshes, farms, vineyards, river cities, and the like; second, the middle realm of forested ridges and plateaus of modest elevation; and third, the snowpeak realm of those standoffish High Cascade monsters, which appear utterly removed, remote—yes, otherworldly, dammit. In his ode to Mount St. Helens, in Danger on Peaks, poet and mountaineer Gary Snyder writes that, “Whatever the numbers say, snowpeaks are always higher than the highest airplanes get.” That enigmatic statement—the “truth” of which I reckon most mountain climbers understand—does nicely reflect the mismatched, top-heavy look of this part of the Cascades: the densely timbered Cascade Crest rising to maybe 5,000 or so feet, and then these oversized, antisocial, ice-armored volcanoes looming that much higher yet. Under the heavy wet-season snowpack they wear much of the year, the High Cascade volcanoes look like dollops of cream upon their blue-black platform. In the dry weeks of late summer and early fall, when their white stuff has shrunk back to individual glaciers and runty snowfields, they still stand out: pale sores on the forested crest, what with their rocky headwalls and spurs and their high barrens of ash, pumice, and outwash. To get a sense for the wacky scale of this countryside, hoof it up one of the “middle-realm” mountains—Lemei Rock in southwestern Washington’s Indian Heaven Wilderness, say, or the hoodoo-rimmed shield volcano of Lookout Mountain east of Mount Hood—on a clear day and gaze up and down the Cascade Crest. Those High Cascade snowpeaks look way too big for their playground. A middle-realm Cascade mountaintop might be a heathery rockpile, a slick of beargrass and rhododendron, a closed-in high wood of mountain hemlock or subalpine fir. 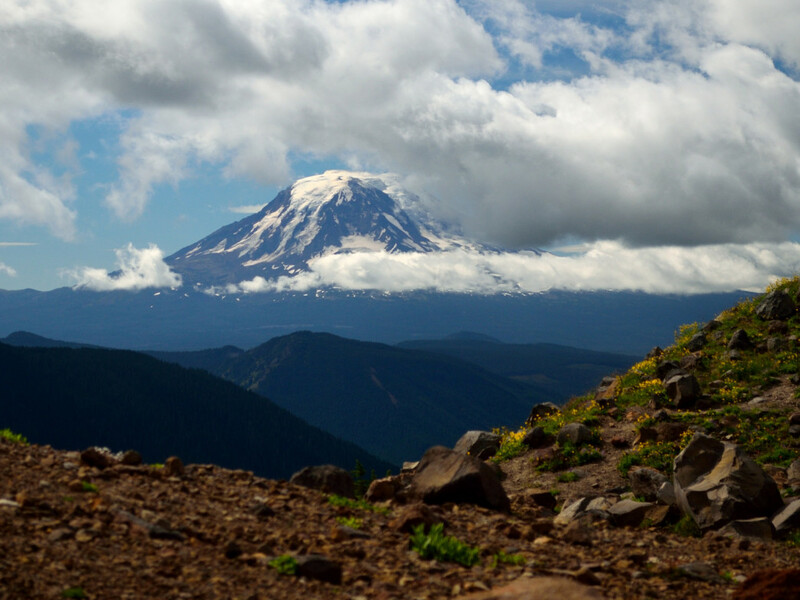 Glimpse Mount Adams or Mount Jefferson from such a vantage, and you see there’s still another realm skyward from your hard-earned position, and it’s one of ice and snow and moraines and lava domes and fins. A different world. Of course, many mountain ranges extend beyond timberline into the dangerous and thrilling alpine zone; hell, many boast much more extensive alpine acreage than the Cascades. But the fact that high volcanoes support such isolated and discrete pockets of that zone gives them a unique aura. 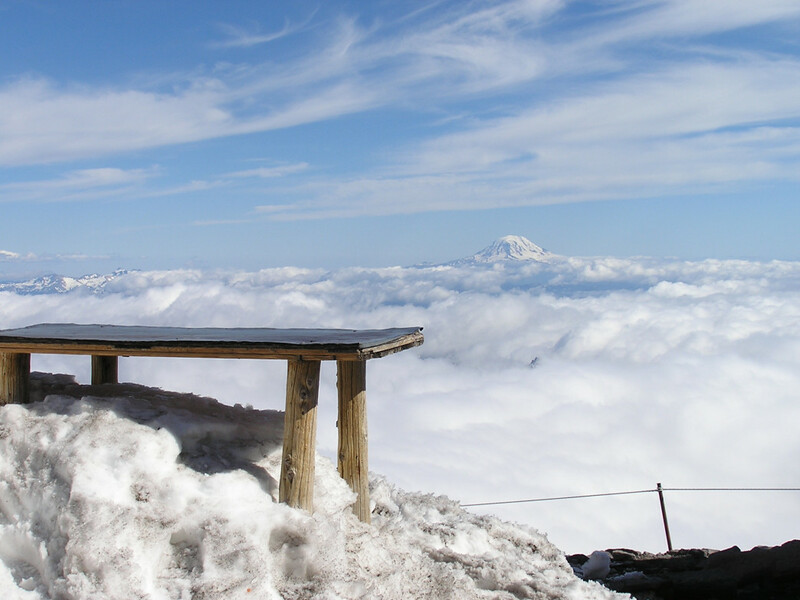 Because these High Cascade snowpeaks can command sightlines of 100 miles or more, that special cloud/ice/snow realm they inhabit is on display to countless lowlanders on either side of the range—another aspect of their dominating and ethereal presence. Cloud caps hiding the lonely summits on an otherwise clear day, pancake stacks of saucer-shaped lenticular clouds above them, bizarre trains of “lee-wave” clouds trailing downwind from them, the drawn-out isolated flames of dawn or dusk alpenglow, the ghostly glow of a faroff horn in strong moonlight—all these phenomena seem, again, unconnected to the lower terrain, and therefore point up the rarefied domain of the snowpeaks. You can, of course, experience that rarefied atmosphere directly. Circle one of the younger, icier stratovolcanoes, and you’ll negotiate their striking radial drainages: fording the glacier-fed rivers that spill off the cones like spokes. Switchback up long grueling miles through dark montane timber, and you might ascend right into the high country’s cold, wet cloud—or maybe you’ll climb through mist and then abruptly, past timberline, hit a sunlit world above the socked-in void. In that unbelievable mountaintop sunshine, you can look from the upper shoulders of your volcano north or south to see other gleaming snowpeaks thrust up above gray nothingness. It’s when you’re atop one of the snowpeaks, looking at the others, that their aloof, roof-of-the-world fraternity really hits home. And don’t forget: Sometimes one or another of these guys, after fuming quietly for a few millennia, goes haywire and blows off some steam. Check out these pictures of a (suitably impressed) climber on Mount Adams witnessing the climactic eruption of Mount St. Helens in May 1980. Now: think of how many times Adams has seen its distant, feistier neighbor spew and thunder. That tense timetable of patient waiting and flashy violence—and the push-and-pull between magma/lava and glacial ice—is also part of the High Cascade snowpeaks’ singular style. That makes for a sobering concluding note. Because, pretty as a lone snowpeak on the horizon surely is, it’s also a bit sinister. Maybe it’s a bone-deep awareness that such a mountain threatens with more than just the avalanches and rockfall its climbers try to dodge. Choking palls of ash, surges of incandescent rock, crushing floods of mudflow: With their long reach, these fire mountains cast a broad and risky shadow. Otherworldly beauty spiced with danger.